Originally published under the title, "Only Muslim Schoolchildren Lives Matter?" Earlier I looked at how Western mainstream media enable Islamic terrorism by employing an arsenal of semantic games, key phrases, convenient omissions, and moral relativism to portray such violence as a product of anything and everything—political and historical grievances, "Islamophobia," individual insanity, poverty and ignorance, territorial disputes—not Islam. Another strategy that recently came to the fore consists of highlighting Islamic terror attacks that target other Muslims. The logic here is clear: How "Islamic" can such Islamic groups be if they attack and kill fellow Muslims? In other words, whatever the motivation, it surely cannot be Islam, since those being killed are themselves Muslims. This suggests that the terrorists themselves cannot be true Muslims since Muslims are generally forbidden by Islam to kill other Muslims (caveats exist). Muslim persecution of Christians ... throws a wrench in the media's narrative that Islamic violence is a product of anything and everything but Islamic hate for non-Muslims. A recent example of this is the December 16 Taliban attack on an army public school in Peshawar, where 145 people were killed, the majority being schoolchildren age 18 and under. This incident was reported all over the mainstream media, and rightfully so. Yet this begs the question: why do similar attacks, when directed at non-Muslims—especially Christians—rarely if ever get the same sort of media coverage? A suicide bomb attack in a Christian secondary school in the town of Potiskum in Yobe state, north-eastern Nigeria, has killed at least 47 people on Monday as the students gathered for morning assembly. Boko Haram is thought to be behind the blast, having carried out several attacks on schools giving a Western-style education. Translated from Hausa, Boko Haram means "Western education is forbidden" of which this latest school attack is a stark reminder. Earlier in the year in Nigeria "Boko Haram claimed the lives of 59 students at a Christian school … Some 50 men ambushed the school, then beat and shot staff and students. Once finished, they set fire to the buildings, with many students still inside. It's the fourth attack of its kind since May of last year." The massacre was one of the most severe in terms of children who died since the beginning of the conflict in Syria. According to official Syrian sources, a car bomb and a suicide bomber caused two explosions when the children came out of school, in the suburb of Akrameh inhabited mainly by Alawites, with the targeted intention to cause the highest number possible of deaths among children of the same religious community to which the Assad family belong. I want to tell you about Tuesday. It was a terrible day. We cried and prayed all day. Tuesday they were bombing Bab Touma, the old city of Damascus. A lot of Christians live there. There is also a Christian school—a private one. We know a lot of people in that school. Some children from our area also go to school there. When those kids went to school on Tuesday, gathered at the square like they always do, a mortar fell in their midst. Some friends passed by the school and saw that parents and teachers were carrying their wounded children out of the school, dripping with blood. They saw them running to the hospitals in panic. For me, as a mother and a teacher, I can hardly bear to imagine what these people must be going through right now. Twelve people lost their lives in that school, most of them children from the elementary school. Many more of them have lost arms and legs or have other injuries. As for Islamic attacks on Christian schools that do not lead to casualties, these are quite common. Thus, on November 5 in Bangladesh, hundreds of Muslims, some armed with knives and machetes, attacked a Christian school. They torched its library, burned Bibles and hymnals, and committed other wanton acts of violence. According to a source, "A wave of panic swept through the school and traumatized everyone. Many students became sick in the following days." The reason for this particular attack? Muslim projection: a rumor started that the Christian school was converting Muslim students to Christianity. How many of those Western people who could not help but hear about the Peshawar attack—considering its widespread coverage—also heard about these Islamic attacks on schools some of which also took large numbers of children lives? Not very many, I would wager. The reason, again, is obvious: reporting Muslims killing Muslims does not contradict the mainstream media's narrative but ostensibly enforces it. For—so the simple logic goes—Muslims who kill fellow Muslims cannot be "real" Muslims to start with, and must in fact be, as Western politicians habitually characterize them, mere "criminals." Thus, the NATO-led International Security Assistance Force in Afghanistan issued a statement condemning the Peshawar attack, adding, "The barbaric actions of the Taliban illustrate their lack of value for human life and lack of respect for the Islamic faith. These attacks only prove their selfish desire for power and willingness to murder to reach their self-serving goals." On the other hand, it is more difficult for the media to dissemble the motives of Muslims who intentionally target and kill "the other"—outnumbered and defenseless "infidel" minorities—simply because they are "the other." 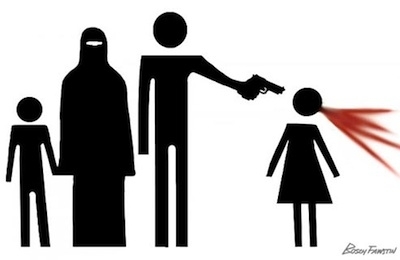 Whether small numbers or large—whether four children decapitated for refusing to renounce Christ or whether the largest massacre of Christians in Syria—Muslim persecution of Christians will rarely if ever get MSM coverage, for it throws a wrench in the media's narrative that Islamic violence is a product of anything and everything but Islamic hate for non-Muslims.